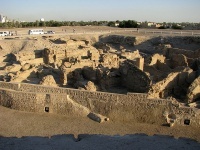 Located roughly two miles (4km) from Manama along the coast of Bahrain, the archaeological site of Bahrain Fort (Qal'at al-Bahrain) is one of the largest in the country and has been listed as a World Heritage Site. As the capital of the ancient Silmun Civilization, this site represents Bahrain's role as a centre for commerce and cultural exchange. Excavations have revealed the ruins of six cities near the fort, dating as far back as 3000 BC, however only 25 percent of the site has been uncovered. Visitors can see the remains of several necropolises along with city walls, and many copper and ivory artefacts and examples of Barbar pottery. There is also a visitors centre, with displays of ancient life. Tourists can easily dedicate an entire afternoon to the site, which also has a cafe. Be aware that bottles of water are much cheaper at nearby shops, which do not charge tourist prices.